Most people get turned off by exercising because it feels like work. Well, guess what—children have fun exercising, and so can YOU! The first step is to get outside. Then, the key to truly enjoying your exercise is to play like a child. Children run as hard and as fast as they can, stop to catch their breath, then start right up again. Some of you veteran exercisers out there might notice that this is quite the same formula as High-Intensity Interval Training, or HIIT. HIIT has been suggested as the best way to burn fat, build muscle and get in shape with the least amount of time commitment. Terrific! What’s even better is that it is an instinctual way of working out that every child has mastered. Try applying the “play like a child” principle to these six fun outdoor exercises to reap the greatest benefits. Tennis. With the return of nice, warm weather comes the return of outdoor tennis. 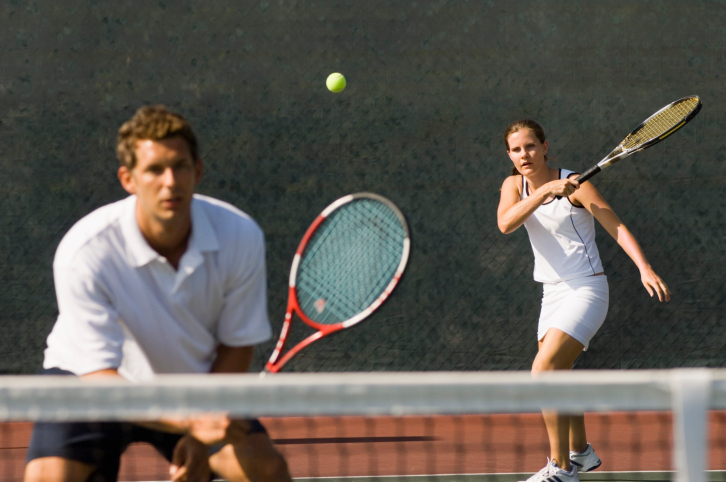 Whether you’re a competitive rallier or just like to hit some decent balls, tennis is a fun form of exercise. It requires you to move your feet, engage your core and control your arm strokes. Plus, the natural rhythm of the game is similar to HIIT. Of course, you need a friend who likes to play as well. Hitting against a wall on your own can only be fun for so long. Don’t be afraid to contact your local tennis club or association and ask if anyone is looking for a hitting partner at your current skill level. Mountain biking. While biking up and down rugged, rooty mountain trails may seem intense, hear me out. 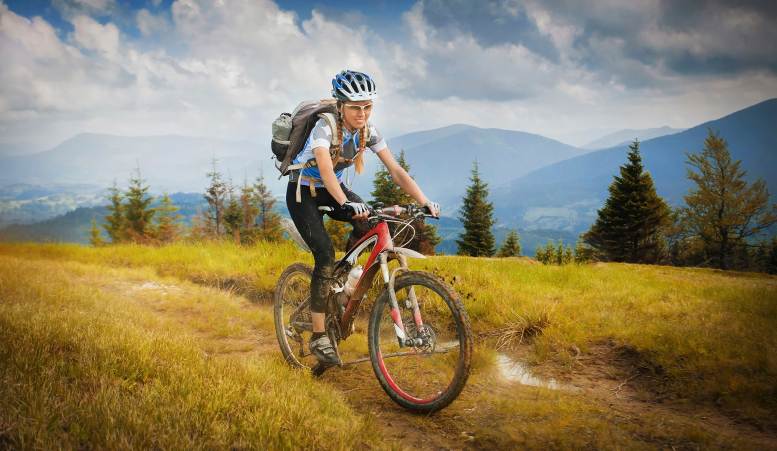 For those who find hiking too slow and boring, mountain biking is the perfect alternative—fit for all ages. You get to travel through beautiful landscapes quickly, and rolling downhill is incredibly exhilarating. Some people bike on flat or rolling trails while others bike on literal mountains. Try it out and see what type of mountain biking you enjoy. Trail running. Not down with a velocipede? Utilize your legs and go run on a trail. Trail running is more exciting than running on pavement or a monotonous, cyclical track because it gets you out in nature where anything can happen! The uneven terrain also makes your body work harder and become stronger than on pavement. If you’re near a sandy beach, beach running takes the challenge one step further with your feet working against the soft sand. No matter what you choose, running out in nature is nourishing to the soul. Hear the birds chirping, chipmunks burrowing and get in touch with the earth’s naturally winding terrain. Your heart rate will definitely get up and your stress levels will go down. Dog walking. If you’re not into taking up a new hobby, why not let your canine pal support you? 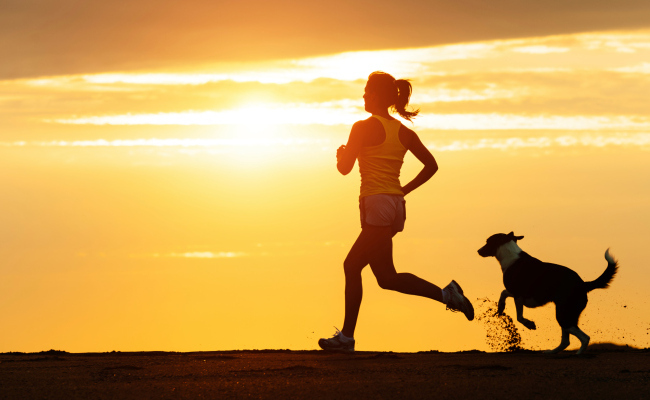 Most of us don’t give our dogs (or ourselves) nearly enough exercise. But, with a good walk or jog every day—maybe twice a day—both of you will be fitter and so much happier. And let’s be honest, your dog’s unflappable enthusiasm and desire to move and adventure makes everything more fun. If you don’t own a dog, volunteer to walk pups at your local shelter, who can always use the help. Stand-up paddle boarding. If you like to get out on the water, stand-up paddle boarding is a great way to build that all-important core strength. 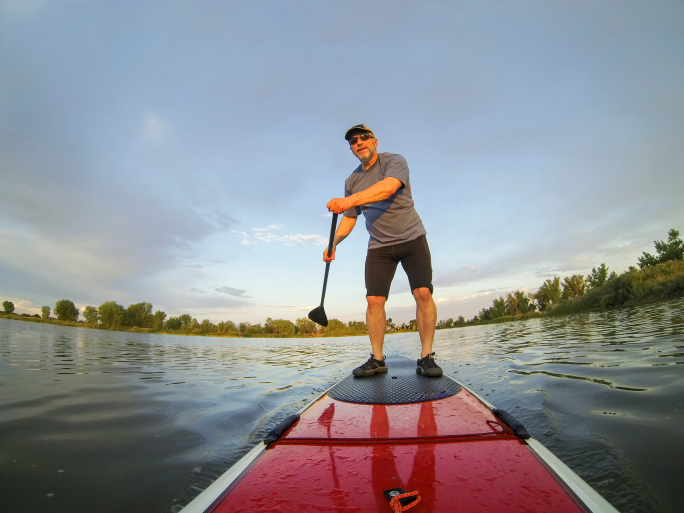 Standing on a paddle board engages all sorts of intricate, important balancing muscles you wouldn’t normally use, making it an excellent outdoor exercise that feels therapeutic. Rowing in a kayak or a canoe is also a good form of low-impact cardio if you keep moving and don’t allow yourself to simply float down a lazy river. Make a campfire. Just want to hang out in your back yard? Make a camp fire. Building a fire is a surprisingly good workout. Plus, you get to hang out and chill by a toasty fire when you’re done! Grab a small axe or a hand saw and go collect and process wood from the depths of your land. It takes some knowledge and experience to build a good fire, but it’s truly a worthy skill to know. Like they say, a good fire will warm you twice: once putting in the effort to gather and process wood, and again when you sit down next to your flaming success. Awaken your inner child and go get some fun playtime and exercise outdoors today. What are your favorite, fun outdoor activities that function as workouts? Share below. Pulling weeds works for me. !